I have studied Manolo’s work for the last six years and in the beginning, I was taken by the “magic” of it. And then I began listening to him and understanding that all his work is grounded on a keen understanding of biomechanics and what is healthy for the horse. So, the first part of being able to do this work is to understand what balance is, what even-ness (straightness) is, what suppleness is and what tension is. And what tension does to the horse’s mind and body and how to eliminate it. That is something anyone who is willing to apply themselves can learn – to a different degree but still, learn. When we filmed Manolo and Jillian Kreinbring and recorded her first five lessons with him, what was interesting is the amount of information we elicited from Manolo. What we saw was work that is logical, progressive and incremental. You can see over five sessions how the student’s ability to organize the horse’s body and begin to influence posture grows. And you can see how that basic work is the same work that is being used to organize and influence the posture of advanced horses. To be effective, one does not need to be Manolo but one needs to understand healthy posture, good alignment, diagonal pairing, understand what two and three track work is, understand how the body closes and opens and what is healthy and not. Understand what a good walk, trot and canter is and what that looks like body wise, and all gaits in between. That is something that can be taught. Not everyone can be Manolo like not everyone can be a Mozart but it is well within reach to be a good musician and help the horse. It is quite fascinating to watch his students and see the ones who develop an affinity for this work. Its often a surprise to me. This is therapeutic work. It is not Dressage just for the sake of Dressage, it is work that a cowboy, jumper, endurance rider, etc…can use because it can improve any horse. That it leads to beautiful lateral work and eventually piaffe and passage is a great side benefit, but not the reason Manolo’s work evolved as it has. The entire purpose of the in-hand, hands on and riding is to develop a fitter, healthier, sounder horse. And so, to any degree someone can learn from it, the horse benefits. Because Manolo does not have an academic foundation and never read any theory books, he learned through experience and because he is essentially a practical farmer, his work is really simple and always logical. It draws from his observation of how tree grows, how a bow works, how you build a house or how to fell a tree in a forest or a pasture. His reference point is always nature. Once you understand the logic, it becomes a matter of practice and observation and reflection. It is kind of fun to watch him work and look for how he is applying his logic and then go ask him if I understood right. For me, I study this work so I can write about it, share and preserve it. For some of his students, its all about furthering their connection with their horses, for others they want to learn how to rehab horses in hand, for others they want the P/P/P. But at the end of the day, its all the same work. Of course, MM has a dexterity that is impressive. It took a lifetime to refine it to his degree and it will take some patience and practice for someone to become fluent in this work. Some of the things he does are really breathtaking. He can run next to a horse looking forward and touch each hind feel in time without ever looking back. 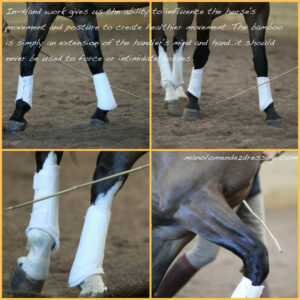 Or he can work with two bamboos and influence the front feet and back feet while the horse is trotting. It takes feel and experience to do that but first it takes understanding movement, seeing irregularities and knowing what limb to influence, when. I always tell people to try and understand WHY Manolo does what he does, because just copying his actions without understanding WHY he does what he does with this or that horse is futile. But if you understand why, then you are learning the thinking process, the logic, and you can fly. And that is his hope, that people learn the logic of the work, and make it their own. 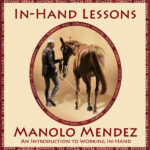 This knowledge of movement and body, wether someone can do what Manolo does or not, is necessary knowledge to be a good horseman. Otherwise, how can the rider be effective? Long lining, short lining, in-hand, it is all the same work because it is always about working WITH the horse. Manolo goes from working close to the horse to working further away. When working on piaffe he works on both sides of the horse and uses the wall to help the horse be straight, when the horse understand and is strong enough, he will take it to the center line and then back to the track. Center line is important because when on the wall, the horse has his attention on the side where the handler is and that attention can translate in a little more tension on one side then the other and that can lead to crookedness (that’s why you work both sides). On the centerline, with the handler behind that is a non issue and it also refine the horse’s self carriage since there is no wall. This prepares the horse for competition when he will be asked to travel in piaffe or passage down the centerline and in a test arena without walls. You can think of bamboo as a cross between a paint brush and an extension of your arm. It is meant to help the horse develop good posture, even gaits, eventually more suspension, articulation, bend, etc…and do so in independent balance. It was interesting for me to see how Manolo begins encouraging independent balance from the very first time her works with the horse and always without tension. It is really a slow, progressive approach.